This “Resources” webpage includes general information for merchants (past, present, and future). If you’re looking for information you believe would be helpful for all merchants and would like to see it included on this web page, please let us know by emailing holidayshops-merchants@jlw.org. You can also email us if you have any questions or need more information. Merchant Photos If you were unable to submit photos for the Merchant Jury or with your original application, please email them to holidayshops-merchants@jlw.org; indicate in the subject line “photos attached for application sent earlier.” We will be using your photos to help promote the wonderful items available at Holiday Shops. Booth Sizes/Preference If you are accepted to our 2017 Holiday Shops, you will receive an acceptance email and need to log in to your Merchant Home Page to submit your booth size preference. Once your booth request is confirmed by Holiday Shops, links to make your booth deposit and final payments will appear on your Merchant Home Page. Please contact webmaster@jlw.org if you were accepted but do not have payment links or did not receive a contract to complete and return to Holiday Shops. Please contact holidayshops-merchants@jlw.org if you did not receive an email from Holiday Shops regarding your application submission. 2017 Merchant Contract The 2017 Contract is provided to merchants via email upon acceptance to the show. Contracts are final once countersigned by JLW. Booths are assigned once all booth fees (deposit and balance) are paid in full. Merchant Handbook and Exhibitor Attachment The 2017 Handbook will be available early this fall and will be provided to Merchants via email once you are accepted to the show and all contracts and booth fees have been received by JLW. 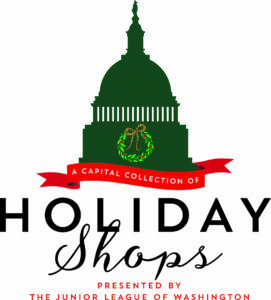 Form to Remit Washington, DC, Sales Tax Collected During the November 2017 Show Merchants at our 59th Annual Holiday Shops in November 2017 will be required to submit a DC tax form along with sales tax collected (6% for goods in DC). The DC Sales Tax Form will be provided to merchants directly once accepted to the show.